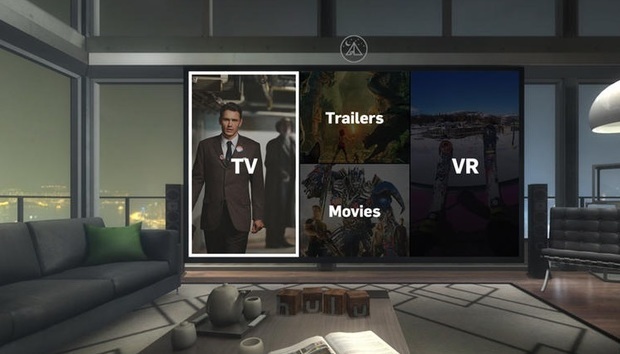 First, Hulu laid the groundwork by releasing a virtual reality app for the Samsung Gear VR and Oculus Rift headsets, and now, it’s looking to capitalize on it. The premium streaming service says it plans to release two serial programs exclusively for virtual reality headsets, according to Variety. The new programs won't even play on standard screen. They will only be accessible with a Gear VR or an Oculus Rift. Variety says Hulu plans to roll out its app to more virtual reality headsets in the future. Virtually Mike and Nora is a comedy show starring Nora Kirkpatrick (Greek, Jennifer Falls), and Mike O’Brien (Saturday Night Live). Kirkpatrick told Variety that the show aims to make the viewer part of the show. “I think we’ve come up with a way to break down the wall between performer and audience member, and explore comedy in 360 degrees,” she said. The second show's called The Big Picture: News in Virtual Reality and sounds like it will be a news magazine. That show will be released in two week intervals and contain video shots that appeal to virtual reality, such as panoramic views. An early edition of the news show will feature a report from a refugee camp in Northern Kenya, according to Variety. At this point, the two shows are only an experiment. Hulu's backing five episodes of Mike and Nora and ten episodes of the news show. The story behind the story: Virtual reality is still in its early stages as a mainstream consumer technology. Nevertheless, many major content producers are excited about it and looking to experiment. Gaming gobbles up most of the VR focus but others such as Hulu and YouTube are also looking to create mainstream TV-style content. Netflix, on the other hand, is holding back. Company executives said in May that Netflix wasn’t investing in VR content due to the small market of VR headset owners, as well as concerns about the “active” role of looking around you that VR encourages. “We are more focused on a lean-back, relaxing experience,” Netflix CEO Reed Hastings told Venturebeat. Smaller content producers are experimenting with VR shows you experience, rather than just watch. Tested.com co-founder and former Maximum PC editor-in-chief Will Smith began a virtual reality talk show earlier in 2016 dubbed The Foo Show. The enthralling talk show is available only on Oculus Home and Steam. For an interesting look at Smith’s experiences creating Foo, check out our extensive interview with him on The Full Nerd podcast.